"But Samuel replied, "What is more pleasing to the LORD: your burnt offerings and sacrifices or your obedience to His voice? Listen! Obedience is better than sacrifice, and submission is better than offering the fat of rams." To put this verse in its proper perspective, I will share the whole story. God's instructions were specific and precise. Nothing and no one was to be spared. All were to be utterly destroyed. King Saul went to Amalek, and he followed God's instructions—but only to a certain point. He destroyed every man, woman, child, and baby—except King Agag. Instead of killing him, as God had clearly instructed, he made him a prisoner of war. He destroyed all cattle, sheep, goats, camels, and donkeys—except the best ones. Instead of killing all of them, as God had specifically told him to do, he killed only what was "vile and refuse". The best ones he held back with the best of intentions. He and his soldiers planned to hold them back to sacrifice them to God. What motivation could be more noble, right? God revealed King Saul's disobedience to Samuel, and hearing of what King Saul had done deeply grieved Samuel and compelled him to cry out to the Lord all night long. God told Samuel of King Saul's exact location, and early the next morning, Samuel went to talk to King Saul. "And Samuel came to Saul: and Saul said unto him, Blessed be thou of the LORD: I have performed the commandment of the LORD. And Samuel said, What meaneth then this bleating of the sheep in mine ears, and the lowing of the oxen which I hear? And Saul said, They have brought them from the Amalekites: for the people spared the best of the sheep and of the oxen, to sacrifice unto the LORD thy God; and the rest we have utterly destroyed. Then Samuel said unto Saul, Stay, and I will tell thee what the LORD hath said to me this night. And he said unto him, Say on. And Samuel said, When thou wast little in thine own sight, wast thou not made the head of the tribes of Israel, and the LORD anointed thee king over Israel? And the LORD sent thee on a journey, and said, Go and utterly destroy the sinners the Amalekites, and fight against them until they are consumed. Wherefore then didst thou not obey the voice of the LORD, but didst fly upon the spoil and didst evil in the sight of the LORD? And Saul said unto Samuel, Yea, I have obeyed the voice of the LORD, and have gone the way which the LORD sent me, and have brought Agag the king of Amalek, and have utterly destroyed the Amalekites. But the people took of the spoil, sheep and oxen, the chief of the things which should have been utterly destroyed, to sacrifice unto the LORD thy God in Gilgal. For rebellion is as the sin of witchcraft, and stubbornness is as iniquity and idolatry. Because thou hast rejected the word of the LORD, He hath also rejected thee from being king." I have always read this story with deep sadness, as to me, the ending of King Saul's reign and especially the end of his life is one of the most heart-wrenching accounts in the Old Testament. To think of his potential and how God's anointing was upon him and how, because he thought he knew better than God, he fell and lost everything. There are so many takeaways from his life's story. At first glance, we may think the repercussions of his disobedience were too severe. We may come to the conclusion that he should have been given another chance—that it really made a lot of sense to spare the best animals and to intend and insist upon using them as sacrifices to God. I'd like to share seven things about this story that God is teaching me. 1. God values obedience more than He values sacrifice. So often, as Christians, we feel like if we adopt a martyr mentality, we are pleasing God. We pour ourselves into "good things" like preaching, teaching, outreach, and all sorts of ministerial endeavors that He has not even asked or called us to do, disobediently "offering up" our time with the ones who matter most on the altar of "sacrifice." Obviously, there are spiritual gifts and callings God places upon individual lives, and there is a Divine will for all of our moments and days. But, if doing what we do conflicts with our personal calling and/or God's Word, we are walking in disobedience, regardless of how much our human reasoning tells us our way makes more sense. 2. There are only two types of sacrifice. Obedient sacrifice and disobedient sacrifice. 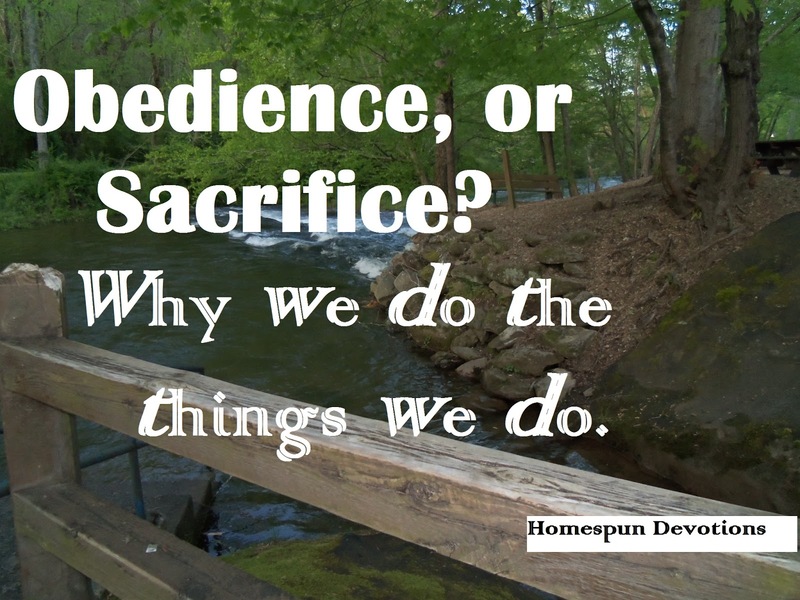 Obedience to God sometimes requires sacrifice, yes, but not always. Just because you are sacrificing yourself, your time, your energy, your talents, and your health in the name of God's work and cause, does not mean you are walking in obedience to God's will. Sometimes obedience to Him means being still from service. Sometimes it means getting quiet before Him and listening to His voice. Sometimes it means resting by still waters, laughing, and enjoying time with your family, instead of rushing headlong "doing" something, in His name. Sometimes it means utterly destroying sin and disobedience regardless of how we justify its value and right to exist in our lives. 3. Pride causes us to choose sacrifice over obedience. Samuel told Saul, "When you were little in your own sight, were you not made the head of the tribes of Israel, and the LORD anointed you king over Israel?" At one point in time, Saul was humble and had a lowly opinion of himself. It was during this time of humility that God made Saul the head of the tribes of Israel and anointed him, king. "For thus saith the high and lofty One that inhabiteth eternity, whose name is Holy; I dwell in the high and holy place, with him also that is of a contrite and humble spirit, to revive the spirit of the humble, and to revive the heart of the contrite ones." Many times, with promotion and position, comes the snare of self-exaltation and pride. We can think we know better than God. We can convince ourselves that we are above God's law. Pride is deceptive and sneaky. When our actions are motivated by pride we often do not even realize it is happening until it is too late. Here are two prayers we should pray on a regular basis. 4. Blaming someone else does not excuse us from the consequences of our own disobedience. He was wholly responsible for his own actions. Yet, when Samuel approached him and pointed out his sin, he immediately shifted blame to "the people" who were under him. "And Saul said, they have brought them from the Amalekites: for the people spared the best of the sheep and of the oxen, to sacrifice unto the LORD thy God; and the rest we have utterly destroyed. Yea, I have obeyed the voice of the LORD, and have gone the way which the LORD sent me, and have brought Agag the king of Amalek, and have utterly destroyed the Amalekites. But the people took of the spoil, sheep and oxen, the chief of the things which should have been utterly destroyed, to sacrifice unto the LORD thy God in Gilgal." Even though he tried to pass the buck, he still reaped the repercussions. 5. When God says "utterly," He means "utterly." He doesn't mean partly, somewhat, half-way, or 99%. Anything less than utterly is disobedience. Period. 6. You can't deceive God. "Neither is there any creature that is not manifest in His sight: but all things are naked and opened unto the eyes of Him with whom we have to do." "Be not deceived; God is not mocked: for whatsoever a man soweth, that shall he also reap." 7. Obeying man instead of obeying God is idolatry. King Saul succumbed to the pressure of the people around him, even though their guidance was at odds with God's command. "For rebellion is as the sin of witchcraft, and stubbornness is as iniquity and idolatry." Ministers, spiritual leaders, and other people can become idols to us. We can choose to take their advice and wisdom over and in place of God's Word. but when their counsel conflicts with the Word of God, or we find that we prefer and seek out their opinions more than we search for God's heart on a matter, or we are afraid to make a move without their consent or approval, it is possible that we are serving them instead of God. While spiritual leaders should be regarded with respect, they are not God. They are human, fallible vessels, not "lords," and their instruction should always be measured by and compared with the Word of God. The Apostle Peter said, "And now, a word to you who are elders in the churches. I, too, am an elder and a witness to the sufferings of Christ. And I, too, will share in His glory when He is revealed to the whole world. As a fellow elder, I appeal to you: Care for the flock that God has entrusted to you. Watch over it willingly, not grudgingly--not for what you will get out of it, but because you are eager to serve God. Don't lord it over the people assigned to your care, but lead them by your own good example." "For the LORD thy God is a consuming fire, even a jealous God." "I am the LORD; that is My name; My glory I give to no other." God wants to be our all in all. He and He alone deserves our wholehearted worship. "You were bought at a price; do not become slaves of human beings." "But Peter and the apostles replied, "We must obey God rather than any human authority." "Obedience to anyone other than God is sacrifice." Here are a few good questions to ask before making decisions. Am I doing this to obey God, or am I sacrificing to please another person? Am I being manipulated by psychological intimidation? Is anyone making me feel that if I don't do this I will be out of God's will, even though God is leading in an opposite direction? What does God's Word say about this? Does the advice and counsel of others align perfectly with what God is telling me to do? Obedience, both when it requires sacrifice and when it does not require sacrifice, will keep us in a place of God's perpetual blessings. In fact, obedience unlocks His blessings! "If ye be willing and obedient, ye shall eat the good of the land." "See, I am setting before you today a blessing and a curse: the blessing, if you obey the commandments of the LORD your God, which I command you today, and the curse, if you do not obey the commandments of the LORD your God, but turn aside from the way that I am commanding you today, to go after other gods that you have not known." "Be careful to obey all these words that I command you, that it may go well with you and with your children after you forever when you do what is good and right in the sight of the LORD your God." "But this thing commanded I them, saying, Obey My voice, and I will be your God, and ye shall be My people: and walk ye in all the ways that I have commanded you, that it may be well unto you." "Jesus answered and said unto him, If a man loves Me, he will keep My words: and My Father will love him, and we will come unto him, and make our abode with him." "For the Lord Himself shall descend from heaven with a shout, with the voice of the archangel, and with the trump of God: and the dead in Christ shall rise first: then we which are alive and remain shall be caught up together with them in the clouds, to meet the Lord in the air: and so shall we ever be with the Lord. Wherefore comfort one another with these words." I will never forget a particular time of prayer in early 2015. Praying is a natural, many-times-a-day occurrence for me. I find that the older I get and the longer I serve Jesus, the more I need to pray. So, for me to say I remember an individual moment spent at the feet of Jesus may sound odd, especially to those who know me well and are familiar with my daily routine. But, there are moments in prayer that are profound—that shake you to the core and leave a lasting, indelible mark, changing the course of your life forever. That prayer was one of those kinds of prayers. We were in the beginning stages of that dreadful identity theft nightmare —the one that turned out to be one of the biggest turning points of our lives. I want to be your all in all." Hadn't I been serving Him since I was a little girl? where I wholeheartedly handed Him the reins? What, in my life, could be competing with Him that would provoke His jealousy? I have pondered His words, "I want to be your all in all," as, over the course of the time between that day and this, He has repeated them to me time after time. I realize now, looking back on the time God spoke those words to me in 2015 that I had no idea of what was coming up ahead, and how one at a time, He would ask us to cut the shorelines to everything that we have depended on to keep us "safe"— the things that were competing with Him as our source. In this post, I talked about how God has called my little family and me out of the boat into deep waters. Events since the writing of that post have plunged us into even deeper waters that are over our heads, and we can no longer feel the ground beneath our feet. As I was praying this morning, it hit me that the only thing we are standing on right now are the promises of God. it is easy to become overwhelmed and even terrified. 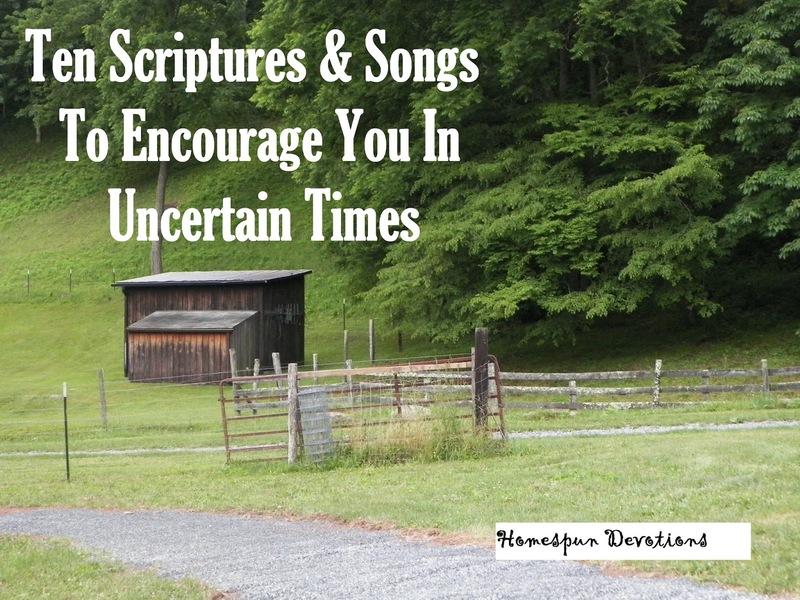 Today, I wanted to share ten Scriptures and encouraging songs that are ministering to me right now. I truly hope they bless you as much as they are blessing me! If you are facing uncertain times, pray, my friend. "And the LORD shall guide you continually, and satisfy your soul in drought, and strengthen your bones: and you shall be like a watered garden, and like a spring of water, whose waters fail not." "Trust in the LORD with all thine heart, and lean not unto thine own understanding. In all thy ways acknowledge Him, and He shall direct thy paths." "This is what the LORD says-- your Redeemer, the Holy One of Israel: "I am the LORD your God, who teaches you what is best for you, who directs you in the way you should go." "But thanks be to God, who gives us the victory through our Lord Jesus Christ." "I will go before thee, and make the crooked places straight: I will break in pieces the gates of brass, and cut in sunder the bars of iron: and I will give thee the treasures of darkness, and hidden riches of secret places, that thou mayest know that I, the LORD, which call thee by thy name, am the God of Israel." "Your eyes saw me when I was formless; all my days were written in Your book and planned before a single one of them began." "And your ears shall hear a word behind you, saying, 'This is the way, walk you in it, when you turn to the right hand, and when you turn to the left." "My times are in Thy hand." God is winnowing our paths, sifting out the things satan tries to inject that are contrary to His Divine will. I am praying for every person who will ever read this. "...the living God, who giveth us richly all things to enjoy." but that is precisely what I am doing today! Let me say that we are not selling this, nor were we asked to write this post, nor are we promised any type of compensation for sharing it. I am doing this simply because I want as many people as possible to hear about an amazing product that is making a huge difference in my husband's health. For many years, Kevin has suffered from severe pain. Anyone who has a loved one who suffers from chronic pain can readily understand how hard it is to watch their suffering and not be able to offer any relief. We pray unceasingly for Kevin's health and for God to help us find something that will help him. and as we walked by a particular table, a gentleman named Dennis stopped us and asked if any of us were in pain. Of course, we all 3 told him about Kevin's suffering, and he invited us to sit down. He asked Kevin where he was hurting the most, and after Kevin told him, he introduced us to a spray product by rubbing it on the areas that were hurting. He then asked Kevin to get up and walk a few feet to see if he could feel any relief. I kid you not, we were all amazed that Kevin began to almost instantly feel better! His mobility improved, and he was dumbfounded to see how much easier it was to walk and bend. Needless to say, we bought the product, and he has been using it daily ever since. I cannot put into words how grateful to God we are for leading us to Dennis! Kevin is feeling so much better, and it is so wonderful to see his pain lessening continually. What is this stuff, you ask? Where can I get my hands on some? and you can order it by calling Dennis toll-free at 877-361-1100. Please tell him you heard about his product from Kevin, Cheryl, and Zach @ Homespun Devotions. Click here to be directed to their website and read more about the product. As I said, we are not selling this or promised any type of compensation. We just want you to feel better! This stuff is all natural. 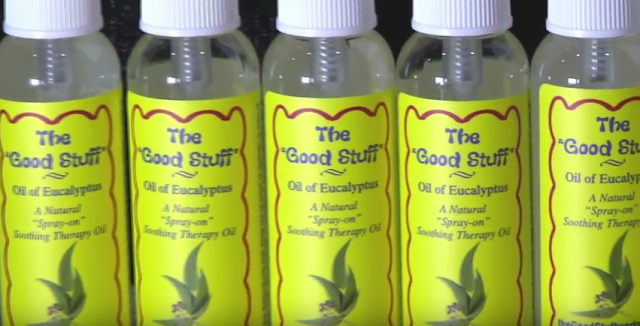 If you happen to order The Good Stuff, we would love to hear from you to see how it works for you! I truly hope someone who reads this will find the blessed relief Kevin is now experiencing. We cannot stop praising God for allowing us to find this, and we are so thankful we can share it with you. God bless you with better health! Introducing The Power Tool© At Biblical Minimalism & New Post At No Sidebar! "I beseech you, therefore, brethren, by the mercies of God, that ye present your bodies a living sacrifice, holy, acceptable unto God, which is your reasonable service. And be not conformed to this world: but be ye transformed by the renewing of your mind, that ye may prove what is that good, and acceptable, and perfect, will of God." Today, I am super-excited to announce the rollout of something I have been working on for a while! It is called The P.O.W.E.R. Tool©, and I share all about it on my new blog, Biblical Minimalism. I'll give you a hint —it has to do with my need to minimize excess body weight and bring the physical slice of my Whole-Person Pie© into alignment with God's Word. Do you long to draw closer to Jesus? Do you happen to need to shed some excess pounds in the process? Why not click over and visit me at Biblical Minimalism where I'll tell you all about what God has been laying upon my heart? I'm picking up The P.O.W.E.R. Tool© and using it, by God's grace! Several are locking arms with me and picking up their own P.O.W.E.R. Tool©. Even if you don't need to lose weight, following this plan will improve your spiritual and physical health! After you visit us there, I'd be tickled pink if would click over to No Sidebar and read my latest post called "Ten Signs That A Friendship Is Toxic." God bless each one of you dear readers! I am most grateful for all of your encouragement and support! "The Lord is my strength and my shield; my heart trusted in Him, and I am helped: therefore my heart greatly rejoiceth, and with my song will I praise Him." The sweet lady who is sharing her Inner Views with us today is beautiful both inside and out. 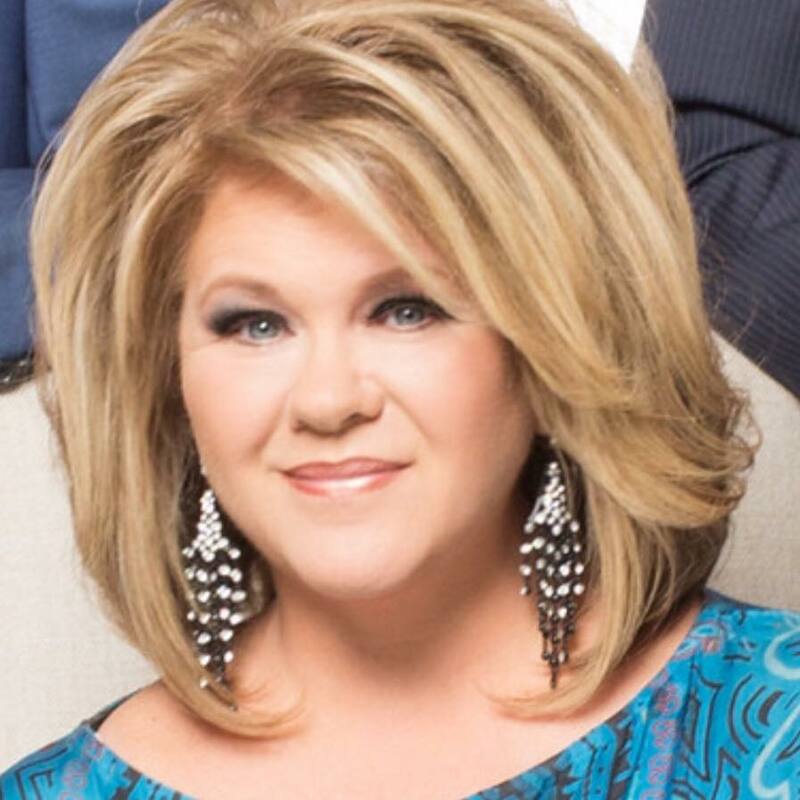 She has a deep love for God and her family and is such a blessing to the world of Southern Gospel Music. and she so graciously granted my request for an interview. Susan: I was born in Lancaster, SC to Roland and Carol Dry. My dad became a pastor when I was 8 years old, so I was blessed to be raised in a pastor’s home. I began singing with my mom and dad when I was 12. We did revivals and Saturday night concerts. I actually met Jeff Whisnant at a concert that we sang at in SC. We began dating a year later and have just celebrated our 30th wedding anniversary. I loved to sing but never dreamed it would be something I could/would do for my living. Cheryl: How did you come to know Jesus? Who introduced you to Him? How has He changed your life? Susan: I asked Christ into my heart at the age of five. We were actually getting ready for church on a Sunday morning... I remember my dad was shaving in the bathroom... I asked him how I could ask Jesus into my heart... he picked me up, put me on the counter and told me! I’m so thankful that I gave my heart to Christ as a child. I rededicated my life to Him at 16 and surrendered to whatever He wanted in my life. Cheryl: When did you first realize that God has blessed you with the talent to sing? Susan: My parents had a Quartet called The Melody Singers that traveled every weekend. I sang my first solo at age 5. I knew then, that this was what I wanted to do. Cheryl: Did you feel the call of God to minister through music before or after you met your husband? Susan: When I met Jeff, I was singing with my family, and he was singing with his. We started dating and after about a year, we realized we would spend our life together. Two years after we were married, in 1990, we surrendered to a “full-time” ministry in music. That was not an easy decision for us as Jeff worked as an accountant, and I was an executive secretary at a bank. We just knew that God had opened the doors, and we wanted to walk through them. We’ve never regretted a mile!! Cheryl: How did God make it apparent that Jeff was the man He intended for you to marry? Susan: We met in SC and didn’t date for a year. Our first date was on July 4th weekend. I actually came home and told my parents I would marry him. It took him a little longer but..... oh well!! God is good! Cheryl: What do you most enjoy doing when you are off stage and experiencing a normal day? Susan: When we’re home, I love to drive my car... doesn’t even matter where... that is so relaxing to me! I also love getting with our friends and going to eat.... spending time together! Cheryl: As you look back over your years singing for the Lord, what is one of the most meaningful demonstrations of the Holy Spirit's work that you have experienced during a concert? Susan: The night we surrendered to a “full-time” ministry was definitely a work of the Holy Spirit that all three of us heard loudly! We had battled with this decision for 2 years... knowing God was leading us in that direction, but we were too afraid. We were comfortable, and family was pushing us away from that decision. However, we were standing on stage in Spartanburg, SC singing, “I Want A Servant’s Heart," and we all three looked at each other and said, “It’s time.” We had no clue how/what God was gonna do. We just finally said "YES," and He took care of all the rest. Cheryl: Who has been most influential in your personal walk with Jesus? How has this person impacted you the most? Susan: My mom and dad have been the most influential in my walk with Christ. God has so blessed them as they have been obedient to the Lord, even when it didn’t make sense. They had no one to help them in their early life, and they totally depended on Christ and His sufficiency to get through each day. They’ve been married 60 years and have taught me to trust Christ in all things. Cheryl: As a Christian wife and mother who is involved in full-time ministry, how do you maintain a sense of balance in your life? What do you most often do when you are feeling overwhelmed by the many hats you are expected to wear? What advice can you offer other women who are struggling? Susan: Wow... being a mom with other responsibilities can most often be overwhelming. I was blessed to homeschool my two boys who are now 23 and 20, and it’s definitely easier since those years are behind us. I would do it all over again just so they could be with us and enjoy being on the road. When I get overwhelmed, I walk and pray... maybe listen to one of my favorite CDs...most often, I just have to be quiet and listen. Cheryl: What would you identify as being one of the main challenges of being in a position of front-line ministry where it can feel that you are being held to a higher standard than those whose Christian walk/ministry is less visible? Susan: Well, the Bible says, “To whom much is given, much is required.” We are to let our light shine daily... whether we’re on stage or at Walmart. I take that very seriously! If we’re serving the Lord, it really doesn’t matter what level we’re on, we are to stay faithful! Is that easy? No! I think people do hold others that are more visible to a “higher standard,” and truthfully I think that’s ok! I always want to encourage those that are coming up and help them realize the importance of representing Christ in everything we do! People are always watching, and we have to be careful.... when we think no one is watching.... someone is!!! Cheryl: How many singing engagements do you accept per year? What are some of the hardest parts of being on the road and away from home? Susan: We do about 180 dates per year which take us away from home approximately 200 days. The hardest part is leaving family behind. Cheryl: If there was one thing you had the power to change about the Christian music industry, what would it be? Susan: I’m not sure of the changes I would make.... would love to see people realize that it’s a privilege to serve the Lord. We’re not doing God any favors because we stand and sing... if we don’t do it, He has someone else that can/will. We should never take an opportunity for granted. Cheryl: As the culture that surrounds us becomes more hostile toward God, His Word, and Christianity, how do you stay encouraged? Are there particular Scriptures, songs, books, or other resources you turn to in times of discouragement? Susan: We are definitely living in a difficult time. Christians are persecuted and made fun of. People that don’t know Christ need to see it lived out in front of them... the old saying “your life may be the only Bible some people will ever read” is probably truer now than ever. I try and stay in the Word. We, as a family, listen to preaching in our car...it’s very important that we feed our souls while we’re off the stage. Cheryl: What is one of the darkest times you have lived through? How did your faith in God sustain you during that time? What were some of the most effective ways members of the Body of Christ reached out to you and helped you through the darkness? Susan: I have had some vocal trouble in the past and you want to talk about scary!! I’m very thankful for the prayers and advice of my friends in this industry that have loved me and encouraged me to keep pressing on. Cheryl: What is your favorite Whisnants' song? Susan: My favorite Whisnant's song is probably...“Even In The Valley.” Honestly, that’s hard because there are so many that I love. Cheryl: Can you tell us about any songs you have written or co-written? Susan: I have co-written 4 songs that are on my solo projects. Cheryl: What are some of the items still remaining on your bucket list? Susan: I really don’t have a “bucket list” per se. I just want to watch my kids continue to grow, get married, and start their own family and see how God continues to use us all together. Cheryl: What is your biggest regret, and what would you most like to have the chance to do over? Cheryl: How can we pray for you, your family, and your ministry? Susan: Pray that God will continue to keep His hand on us as we travel and try to point people to Christ. Also, in this day, pray that God will continue to help us encourage others in their walk with Christ. We live in a different day... people are struggling. Thank you ever so much, Susan, for sharing your heart with us! May God continue to protect and bless you, your family, and your ministry! where you can learn more about them, buy products, and support their ministry. You can also connect with them on Facebook, Twitter, and their YouTube channel. And, please keep them in your prayers as they travel and share the good news of Jesus' love. In closing, this is my all-time favorite Whisnants' song. I can't count the times this song has ministered to me. I hope it blesses you, too!